A time traveling Vietnam veteran is summoned through the "Wind Between Time" and forced to fight in some of the bloodiest campaigns in history. It's similar to the earlier series 'Casca', 'Freedom's Rangers' and 'Lost Regiment' The first book in the 'Time Raider' series introduced us to Dan Samson, former Vietnam War vet who gets thrust through time during a weird medical experiment at a local lab. Samson awakens as a young Private in World War II, forced to fight Nazis in the Italian mountains. The end result? 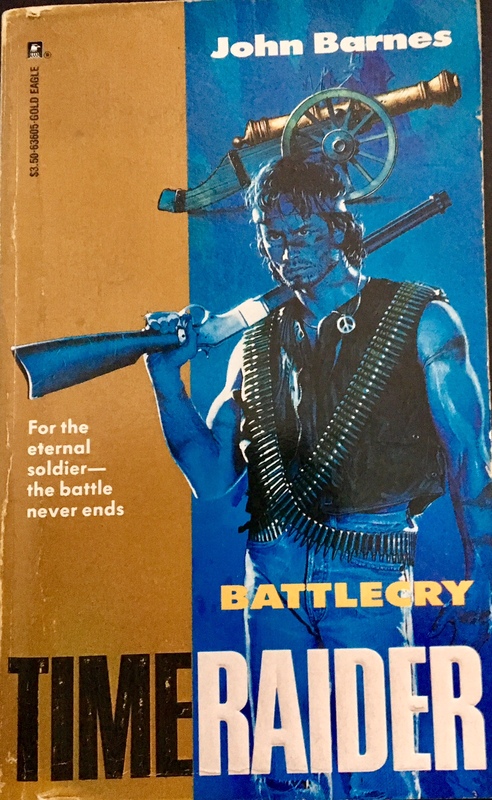 Samson gets killed off but awakens in book two, 'Battle Cry', as a US Calvary solider in 1846. Is it any good? Just like the first book...I could take it or leave it. The book's premise is Samson is Private Hiram Galt, an alcoholic soldier serving the US Calvary in and near El Paso. El Paso to Chihuahua is hotly disputed between Mexico and the US. They like to shoot at each other. A lot. The battle could have been over rather easily if the two parties could have just agreed on a monetary transaction. Yet they didn't and thousands of soldiers died in the campaign. Samson has Galt's memories and he combines that with his own military experience in what amounts to a whole lot of nothing. Samson's superiors want him to carry military plans to another unit. To do this he must go through a territory that is disputed between two ranches. Barrington Taggart is a US rancher who ultimately is very wealthy, and in 1864 that means he has a lot of slaves. The other side of the mountain is Mexican land owner Rancho Bastida, who claims to have Spanish nobility and won't go down without a fight. The two ranchers actually get along fairly well but they don't cross each other. Yet. Samson stops in at Taggart's place first. The old guy treats Samson extremely well with hot water and dinner. After the festivities Taggart breaks out some hanky-panky by bringing in a young slave woman and beating her to a pulp. Samson wants no part in this and he is commanded to leave at first light. That night he leaves the camp with another slave woman, Ysabel, who prompts the two of them to leave Taggart in a hurry. The land barren wants Ysabel back and heads out after the two with a crew of hardened men. The author throws a few firefights at us, mostly just "hit and run" with Samson taking potshots at the crew. The second half of the book is Ysabel's brother Juan showing up. At first he takes Samson captive, however Samson escapes Juan's fort and heads out to fulfill his mission solo. He runs into a pack of Taggart's crew and then runs back to Juan for safety. Together, Juan's crew and Samson take up arms to fight Taggart's gang. It's a little short on plot and seemingly just exists so we can watch Samson skip from Point A to Point B repeatedly. Such a great idea with this time traveling soldier bit but just fails to deliver the goods. 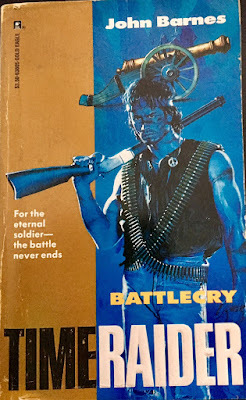 'Battle Cry' was released through Gold Eagle in 1992 and is the middle book of this time traveling men's action trilogy. Author John Barnes wrote all three of these and I'm not terribly certain if the idea was just the three books or if there were plans to do more with it. It has the ability to go further than a trilogy but Barnes may have become as bored as I have with the rather lackluster plots. This has a few surprises in it that I won't spoil here. The mystery is still fairly thick on why Samson is floating through time. Who is Master Xi? Can our protagonist actually die? Will he ever return home? We may never know. It's around 200 pages and makes for an easy read. It beats exercise or manual labor. Sometimes that's enough of an excuse to read anything.